One of the major drawbacks with Dolphin is it doesn't score well in the SEO department. A few years back it had almost none, but even with the current Dolphin 7.1.x version SEO is barely noticeable when compared to many other CMS platforms. Don't get me wrong I love working with Dolphin I just think in this day and age there needs to be more emphasis on SEO improvements rather than new modules or features. The only thing half way new that I have noticed in Dolphin 7.1.x is it now has a built-in sitemap generator, which they should have added years ago. It's a little early to know whether it actually works or does what it is supposed to do. I did notice a few posts over in the Boonex Unity Forum by people having some issues with it. One of the bigger problems I have with Dolphin is duplicate content issues, which can definitely be a factor in search engine rankings. There are tons of Dolphin links that are either exactly the same or very near. And, as you add more content you end up with even more duplicate content. Google says it has around 50,000 pages indexed for this site. There is absolutely no way that I have 50,000 unique pages or posts. Not even close. It says at this exact moment: 52,200 results...Yikes! So let's assume we have a few hundred unique quality posts, but thousands of low-quality or duplicate posts (some containing virtually nothing). This can kill a Dolphin website. From Google Webmaster Tools. 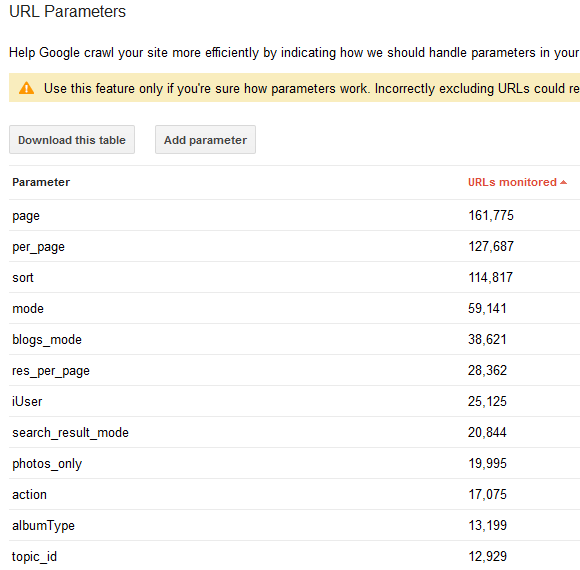 Look at all these similar URL Parameters...One parameter with 160,000+! Really? Not good! These 3 links/pages are almost exactly the same. The only difference between them are the friend's area of the page. Basically there are 14 friends listed, and when you select the "Next page/arrow/link" the next set of 14 are displayed. Nothing else on the page changes. There are actually 28 of these at the moment, plus the standard profile page so 29 pages. All 29 pages are nearly identical and do not add any content value. Those two pages are identical/exactly the same and definitely duplicate content. There are tons of these scattered throughout Dolphin. Implementation of Canonical like many other scripts use might help. If you do not have a Google Webmaster Tools account I would definitely get one. 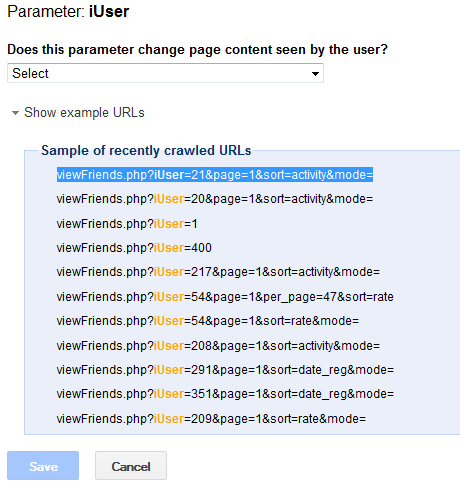 If you do have an account spend some quality time examining the Configuration -> URL Parameters section and see for yourself. I wouldn't make changes to these settings until you do some serious reading up on how they work because it may backfire and you could make things worse if you set them wrong. The bottom line is if Boonex wants to compete and continue to attract new users they really need to work on improving Dolphin's SEO performance. SEO can really make a huge difference.